Happy Saint Patrick’s Day, my Irish and honorary Irish friends! On a day when everyone is demanding to be kissed on account of their heritage, I can’t help but think of my favorite Irish-American lass, Katie Scarlett O’Hara, and the charming rascal who told her that she should be kissed and often, and by someone who knows how. 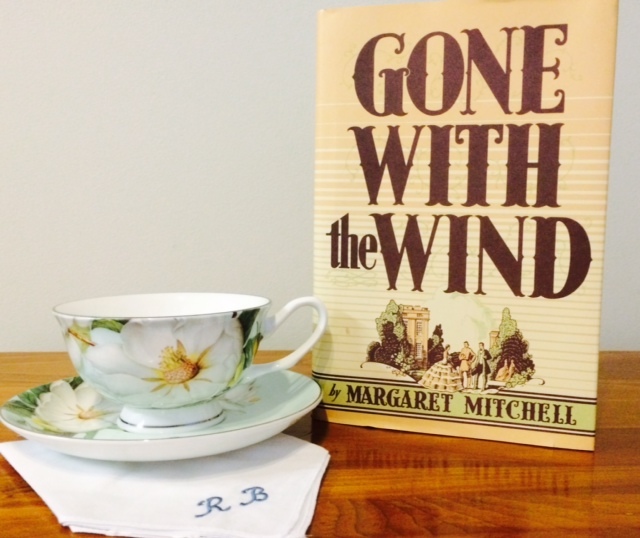 For that reason—and for his appreciation of a good green bonnet— I can think of no better choice for the Literary Hunk of March than Gone with the Wind’s dashing, mustachioed blockade runner, Captain Rhett Butler. Asking why I love Rhett Butler so much is kind of like asking why I love cupcakes. (Am I a human being? Does blood run through my veins?) For starters, there’s his reputation. It’s so bad! He was expelled from West Point, he isn’t received by any good family in Charleston, and let’s not forget about the girl he kept out all night in his buggy and refused to marry. Scandal! He’s a man of mystery and the biggest source of gossip throughout Georgia, and guess what? He doesn’t care. Rhett is his own man and does his own thing. He plays cards with Yankees. He pays one hundred and fifty dollars in gold to dance with a widow in mourning. His BFF is the local prostitute, and he openly announces that the only cause he believes in is Rhett Butler. If there were a Civil War-era version of The Bachelor, Rhett’s season would clearly be the best. Despite his devil-may-care attitude, this conceited, black-hearted varmint is a really good guy, and he actually does care what some people think of him—the people who matter, like Melly and Mammy. (Hence, the red silk petticoat.) When it comes to being a father and stepfather, he’s pretty much the best. As soon as his Bonnie is born, he works on improving his reputation so that she will always be received, and when his stepson, Wade, asks if he wishes he had a boy, he asks why he would want another when he’s got one already. Strong, strapping manly-man that he is, he’s not afraid to cry when the situation warrants. Also, not that it matters or anything, but he’s also stinking filthy rich, which is kind of nice when you need someone to build your monstrosity of a dream house or something. I’ve made no secret of the fact that Scarlett O’Hara is my favorite literary character of all time, and when you have someone that spirited, resilient and downright incomparable, it would seem impossible to create a match for her. But Margaret Mitchell does it. From the minute he first eavesdrops on her at Twelve Oaks, Rhett is madly in love with Scarlett, and for all of his insisting that he’s not—hey, he’s got to do something to separate himself from her legions of beaux—he shows his true feelings through every action. Dancing the Virginia Reel with her. Bringing her the green bonnet from Paris. Risking his life to help her get through the burning of Atlanta, and waiting—and waiting, and waiting—while she marries men she doesn’t love and pines over that doofus Ashley. Apart from Melly and Mammy, he’s the only person who knows her for exactly who she is, and he loves her desperately for it. He shows her that marriage can be fun, and his proposal is probably the best scene in any book or movie ever. Rhett is one-of-a-kind, her perfect match, which is exactly what makes the ending so heartbreaking not just for Scarlett, but for us. But, in the spirit of Scarlett, let’s not think about the ending now. We can think about that tomorrow. For today, let’s celebrate all of the good times Rhett’s given us—the witty comebacks, the charming smiles, and the unwavering love for that green-eyed Irish lass. No one but the charming Clark Gable could have played our favorite blockade runner in the 1939 classic. Period. Miss any of our previous Literary Hunks of the Month? Check them out here. They’re hunky all the year through. Love GWTW any day but this is especially fabulous!! Thank you so much, Robin!! And I agree–GWTW is fantastic any day of the year!!! You make Rhett Butler sound like the most interesting man in the world, the Dos Equis beer man. That’s quite a feat! Haha! Thank you! Rhett IS the most interesting man in the world! Thank you!! It really is the greatest novel. Absolutely incomparable!